World War II caused death and destruction on a scale unknown in human history. While the human cost of the war is of course paramount, the loss of property and with it, the cultural heritage of nations must also be considered. These 9 examples of preserved, bombed-out buildings stand, many as stabilized ruins, in stark contrast to their successors and as testaments to a war that forever changed the world we live in. The Hiroshima Prefectural Industrial Promotion Hall was designed by Czech architect Jan Letzel and opened in 1915. 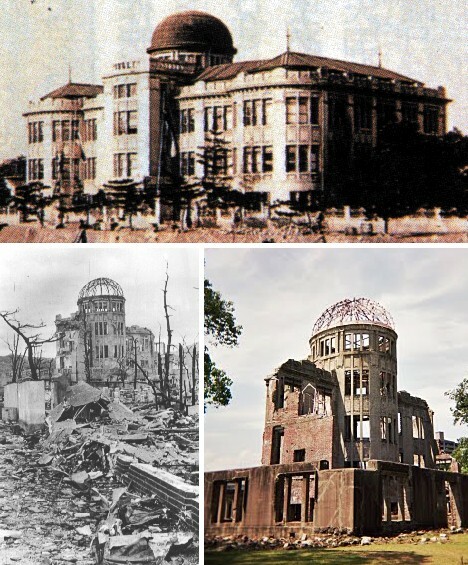 On August 6th, 1945, the atomic bomb known as “Little Boy” exploded 1,968 feet above the building, obliterating in seconds the heart and soul of a thriving city along with tens of thousands of its citizens – yet curiously, the “Genbaku Dome” suffered surprisingly little structural damage. It remains mostly unrestored today as a graphic memorial to those who died that day in 1945 and a reminder to anyone who would take the consequences of war lightly. The year is 1946 and the shattered streets of Hiroshima are eerily silent… Then, turning the corner, an ominous bulk looms into view. Is it a bizarre mutant out for blood? An escaped zoo animal driven mad by radiation poisoning? Nah… it’s just the Kabaya Caramels “Hippo Car”, dispersing sadness by dispensing candy! 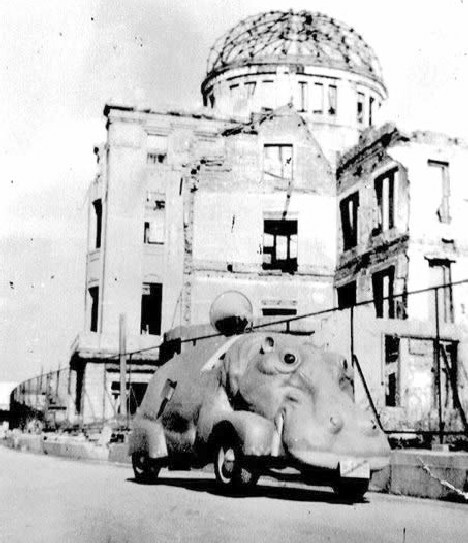 Imagine being a kid in post-war Hiroshima – an encounter with the Hippo Car just might be the best thing to happen to you all day, perhaps all week. Kabaya still operates Hippo Cars today though they’re sleek, modern and bright red. 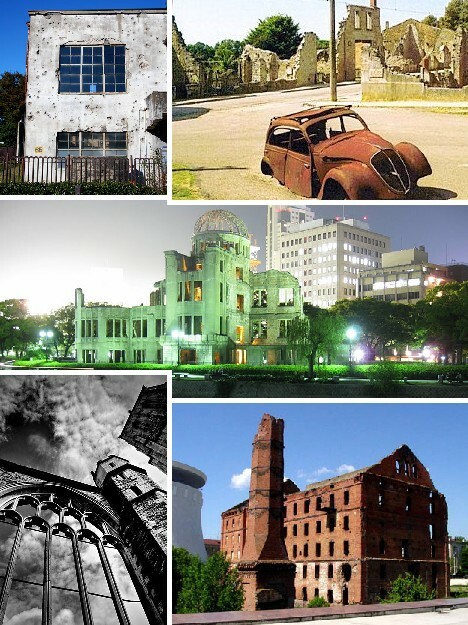 The Hiroshima Atomic Bomb Dome, on the other hand, looks pretty much the same. June 10, 1944 is, for the people of France, a day that will truly live in infamy. 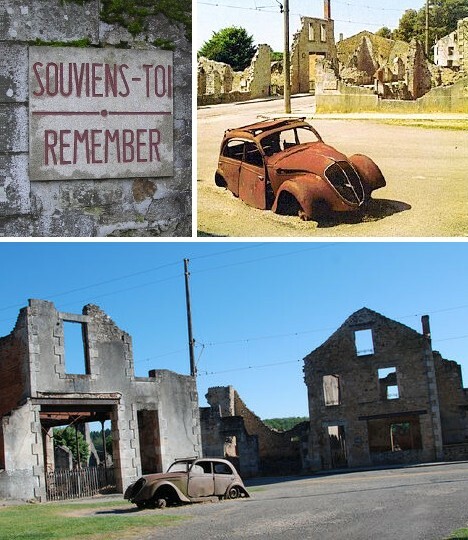 To make a terrible story short (but not to lessen any of its horror), all 642 people of the village of Oradour-sur-Glane were massacred by soldiers of the Waffen SS, who subsequently razed the entire town. Those who died that day ranged in age from one week to 90. 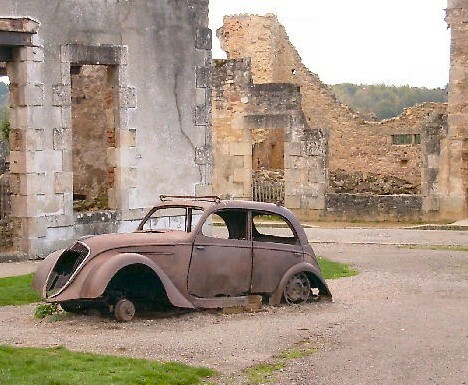 Following the war, French president Charles De Gaulle declared Oradour-sur-Glane to be a Village Martyr. The ruins of the village have been preserved and visitors are asked to remain silent until they have left. The car above is a Peugeot 202 belonging to Dr. Desourteaux, who arrived back in Oradour-sur-Glane after treating a patient. Both the car and the ruined buildings lining the Champ de Foire epitomize the “frozen in time” quality the establishment of the Village Martyr was intended to instill. As the power center of Nazi Germany, Berlin was bombed heavily in the final 2 years of the war. Very few of its major buildings have survived not only the fall of the Third Reich but the difficult transition to first a divided city and now, once again, a great European capital. 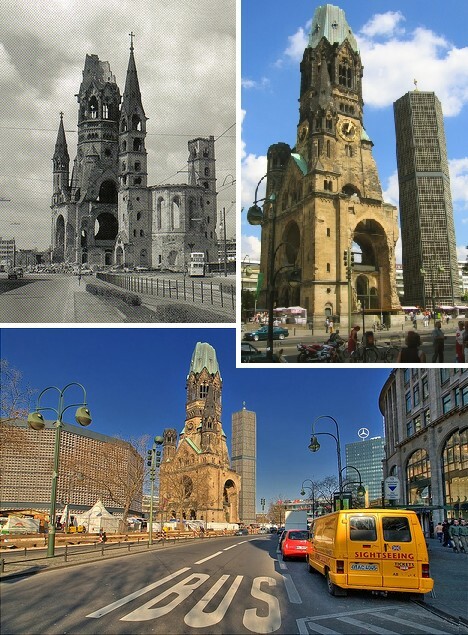 The Kaiser Wilhelm Memorial Church was originally constructed from 1891 to 1906 and was severely damaged in an Allied bombing raid on November 23rd of 1943. The preserved spire of the old church now rests alongside a modernist New Church built between 1959 and 1963. 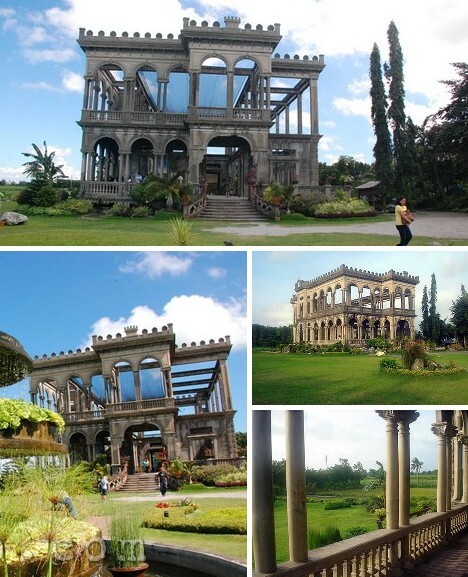 The gorgeous Italianate ruins at Talisay City were formerly a mansion built in the 1890s by sugar baron Don Mariano Ledesma Lacson (1865-1948) as a gift to his Portuguese wife. 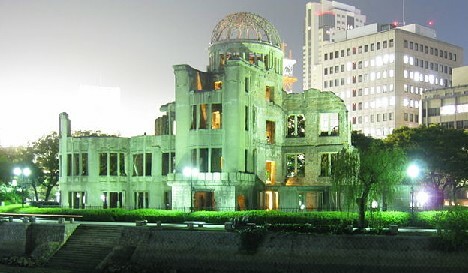 The building was set afire in the early days of World War II to prevent it from falling into the hands of invading Japanese forces, who hoped to use it as there area headquarters. Today the ruins are a tourist attraction with the ruins and grounds owned by Lacson’s great-grandson. 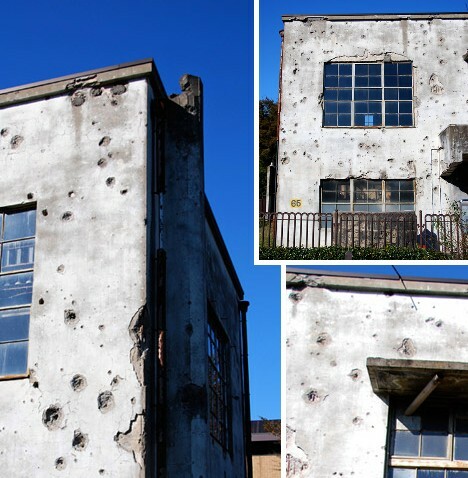 Built by a trio of ethnic-German brothers in the 19th century, the Hergert Mill was one of the only buildings to survive the exceptionally vicious Battle of Stalingrad which raged from August 1942 through February 1943. How bad was the destruction wrought by the battle? See the film Enemy At The Gates if you haven’t already. Today, the mill is preserved alongside the Panorama Museum which houses relics and resources relating to the battle – including the sniper rifle used by Vasily Zaytsev. A battle-scarred building stands, alone and unoccupied, in a peaceful park just north of Tamagawajosui Station in Tokyo’s Tachikawa Ward. 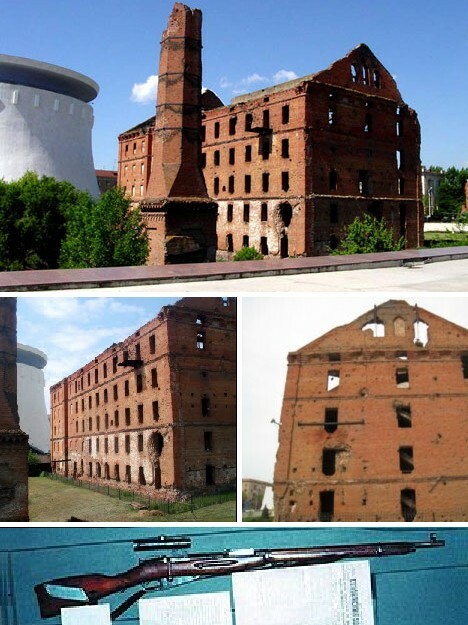 Disused since 1993, the structure is a rare relic of the Second World War’s closing chapter. 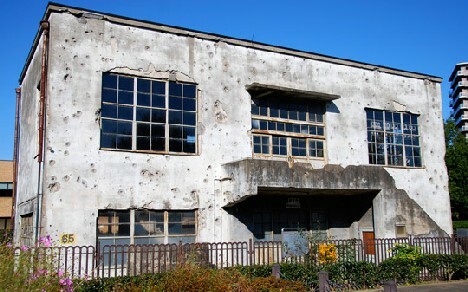 Its pitted concrete walls bear witness to multiple American air attacks on what was, at the time, a substation for the Hitachi Aircraft Company. The photo series published by Tokyo Times catches the building on a brilliantly clear day, with the former substation’s drab concrete walls standing in sharp contrast to the deep blue skies which, in the now-distant past, begat winged fury with guns ablaze. The English city of Bristol was a prime target of Germany’s Luftwaffe due to the concentration of aircraft and war material factories in the area. Nearly 1,300 people died and almost 90,000 buildings were damaged or destroyed in a 6-month period from November 1940 through April 1941 known as the Bristol Blitz. 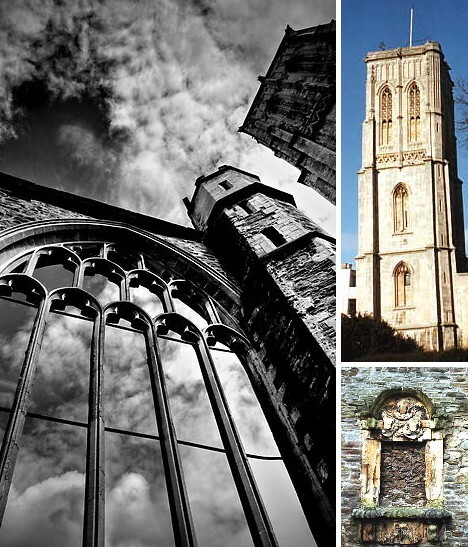 Though most of the wartime carnage in Bristol has been rebuilt or restored, the 14th century Temple Church remains much as it has since the end of the war. The church spire noticeably leans – a result of natural subsidence over the centuries, not the bombing. Intramuros, built in 1571, was the walled capital and administrative center of the Philippines under Spanish rule. Severely damaged during World War II – first by invading Imperial Japanese armies and later by American forces under MacArthur – only remnants of Intramuros’ former glory remain. 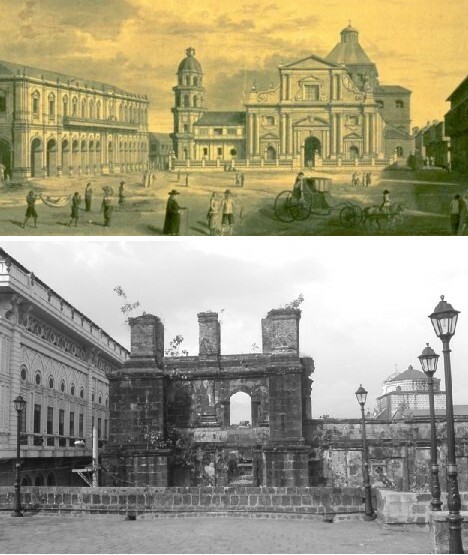 Even so, one can still discern echoes of Intramuros’ former magnificence by comparing the above images of the Plaza Major. London was devastated by waves of Luftwaffe bombing raids in 1940 and 1941 that sought to break the morale of the British people. As we know, property and people suffered immensely but the nation remained unbowed. Few remnants of The Blitz still stand in the City of London but those that do, radiate a timeless serenity that belies their violent origins. One such survivor was captured by the lens of photographer Hamish Reid in 1985. 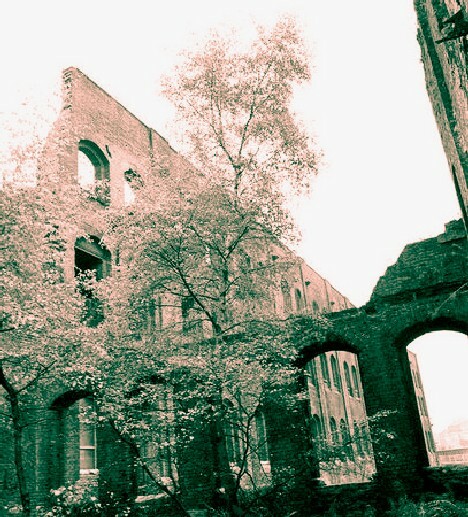 The bombed-out warehouse above is located on Farringdon Road in Islington, right beside the rail station. Reid calls the structure Farringdon Castle due to its resemblance to a medieval ruined fortress. It’s been 70 years since World War II began and almost 65 years since it ended. These 9 battered, bombed but unbroken survivors of the war reflect the enduring strength of the human spirit. Like them, we have emerged from the horrors of war with renewed strength though we carry the scars within and without. To those architects and architecture that have perished, we remember. To those whose blood and bone, bricks and mortar have returned to ashes and dust, these mute memorials maintain our connection to the past, from the present, into the future.